We use Outlook / Exchange at work. Outlook 2016 is nice, but I really love "Inbox" (by Google) because it's clean, you can speed through emails by using shortcut keys (EDIT: By this, I mean I can mark it as "done" and it goes to the next one immediately), and it has a snooze feature built in so you can dismiss an email until later. I know there are apps like Boomerang that can send emails off until later, but they're addons and you're still stuck with Outlook unless you want to use a webapp, which not everyone does. Is there a desktop app, for Windows, that works with Exchange and is clean and simple that I can use to avoid the visual clutter that Outlook has going on? I'd be willing to pay, either out of my own pocket or reimbursement from work, so that puts the maximum at around the $100 AUD-ish ($75 USD-ish) mark. 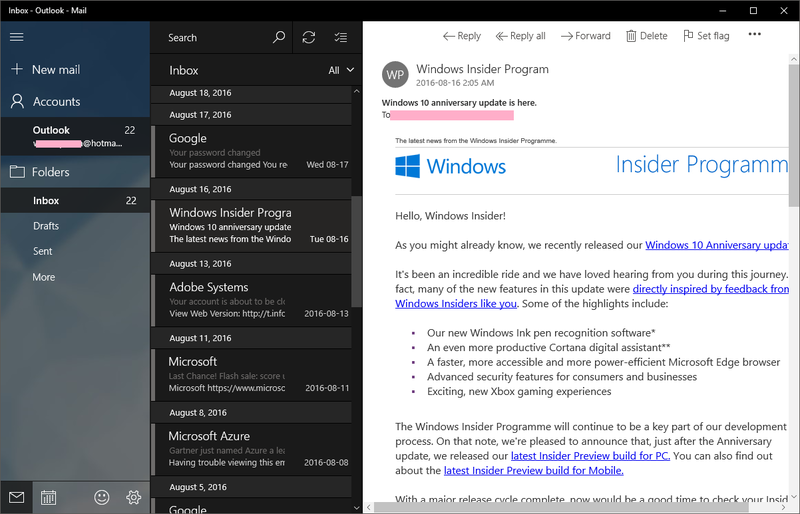 The cleanest and simplest Windows mail client I know is actually the "Mail" app that comes free with Windows 10. It can be used to connect to a variety of email server services. I'm showing it above connected to my hotmail account, but I could connect it also to google mail, to an outlook server, or to any POP3/IMAP server belonging to any internet service provider. Not the answer you're looking for? Browse other questions tagged windows email-client desktop-client or ask your own question.